The structure indicated is the median antebrachial vein. The median antebrachial vein is one of the veins of the superficial venous system of the upper limb. The veins of the upper limb consist of a superficial veins and deep veins. The superficial system consists primarily of the cephalic and basilic veins which originate from the dorsal venous arch and drain into the axillary vein and brachial veins respectively. In the region of the antecubital fossa, the cephalic vein is joined to the basilic vein via a vein known as the median cubital vein. 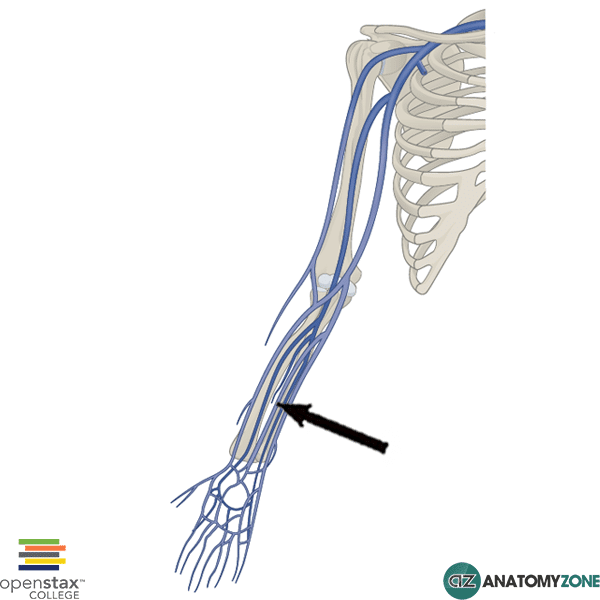 The median antebrachial vein originates from the palmar venous plexus and is shown in this diagram draining into the basilic vein. There is however a lot of anatomical variation in the configuration of these superficial veins. In some cases the median antebrachial vein may divide into two terminal branches, the median cephalic vein and the median basilic vein which drain into the cephalic and basilic veins respectively. Learn more about the veins of the body in this anatomy tutorial.